Democrat Elizabeth Warren says President Donald Trump "may not even be a free person" by next year's election. 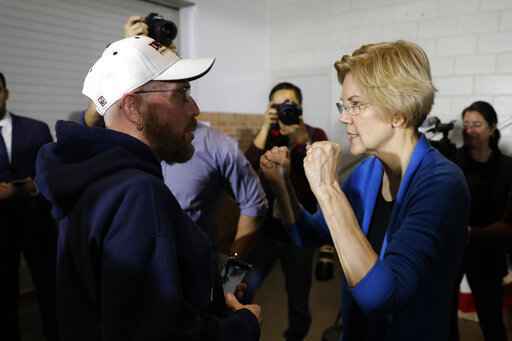 The Massachusetts senator's comments came Sunday as the Democratic presidential candidate campaigned in Iowa a day after Trump renewed his criticism of her past claims of Native American heritage. In a tweet, Trump called Warren "Pocahontas" and said he would see her "on the campaign TRAIL." Sen. Elizabeth Warren is returning to South Carolina this week as part of a tour of early voting states following the official launch of her 2020 presidential campaign. Warren's campaign says the Massachusetts Democrat will make her first trip to Greenville on Saturday for an organizing event. She did something similar last month in the state capitol of Columbia. Warren's South Carolina swing overlaps with Democratic Sen. Kamala Harris of California, who is also eyeing the White House. Harris will be in the state on Friday and Saturday. Warren officially announced her candidacy Saturday in Lawrence, Massachusetts, and is visiting New Hampshire and Iowa this weekend. In addition to South Carolina, she is also making stops in Georgia, Nevada and California.